iRig Pro DUO's high-grade analog circuitry and no compromise power supply design provide studio-quality sound on the go. Its dual XLR/TRS audio input jacks can be used to plug in guitars, basses, keyboards, line-level instruments and microphones to capture pristine and transparent 24-bit audio on the go. Players can record two channels of audio simultaneously using two instruments, two studio microphones or any combination of instruments they desire. It's perfect for singer/songwriters, guitar and bass jammers, duet singers and more - the possibilities are infinite. MIDI controllers and instruments can be connected with ease thanks to iRig Pro DUO's MIDI IN/OUT jacks. All the required cables for connecting MIDI hardware are included (TRS to MIDI-DIN). 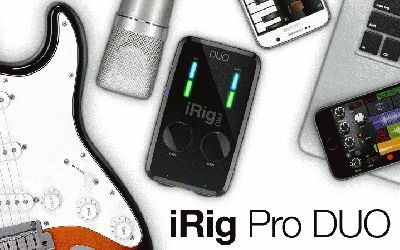 When it comes to recording interfaces, they're really only as good as they sound - and iRig Pro DUO sounds absolutely fantastic. This is due to world class AD/DA conversion, no compromise analog stages, superior power supply, ultra-low noise and high-headroom preamps and professional balanced audio outputs. 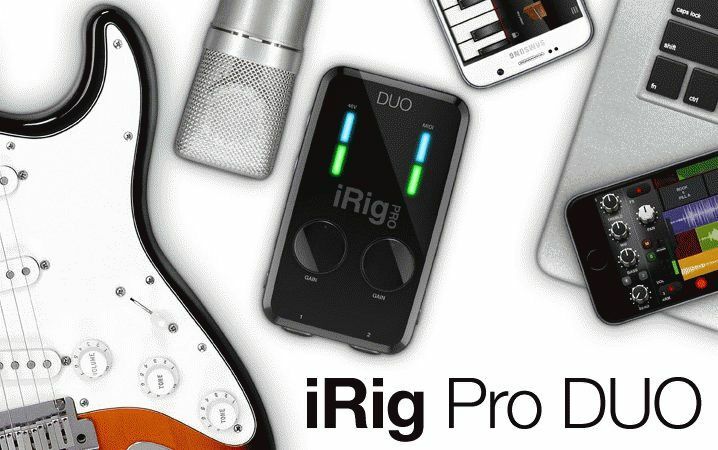 Simply put, iRig Pro DUO lets musicians and producers make great sounding recordings with all the musical subtlety and nuance of a pro studio interface, but in an extremely mobile form-factor.